We posted a bunch of pictures last night and I don’t have time to blog about them right now but I just have to say that Guenna looks so cute in her little bonnet, don’t you think?! She is getting so pretty and the boys are really enjoying her response to them although she responds a lot more to mommy and Aidan wants her to look at him! I just tell him that in time she will totally look up to him and crack up at all his jokes! By the way, Guenna turned two months old yesterday. What a wonderful two months this has been! 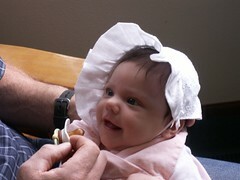 Guenna is beautiful in her bonnet…such a doll! The rest of the pictures were great too…love the wooden shoes :) and is that your garden area? You guys are so blessed! No we don’t have a garden this year, but our good friends the Bryans have offered to let us glean from theirs, that is their garden in the pictures. And their daughters flower garden from last year. Guenna is so cute in her little bonnet! I agree with Roberta, she looks almost like a little doll. Baby girls are so much fun to dress up, you must be enjoying your first little girl so much Jenni! Happy 2 month birthday to Guenna, doesn’t the time just seem to fly by?